Reuben Newsome and Jon Reader, vets at Synergy Farm Health and of the Cattle Lameness Academy, share their insight on digital dermatitis. Digital dermatitis (DD) is no new disease and is found in the majority of UK dairy herds, yet our understanding of it continues to grow. Here we discuss some of the latest developments, emerging challenges and current thoughts on the treatment and control of DD, particularly highlighting the importance of collaboration between the farmer, foot trimmer and the vet. DD is caused by bacteria that infect skin, primarily of the hind feet. The active infection appears as a bright red “strawberry-like” lesion on the heels, causing severe pain and lameness. Once DD is on a farm it circulates within the herd and environment and there is no known way of eradicating it. 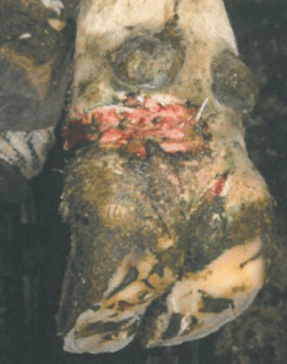 In addition to causing lameness itself, it can infect the healing tissue of sole ulcers and white line disease, delaying their healing, therefore getting and staying on top of DD is a vital aspect of any lameness control program. Treating active lesions, to facilitate them towards a dormant state. Preventing uninfected cows becoming infected and preventing dormant lesions from re-activating (i.e. by foot bathing). 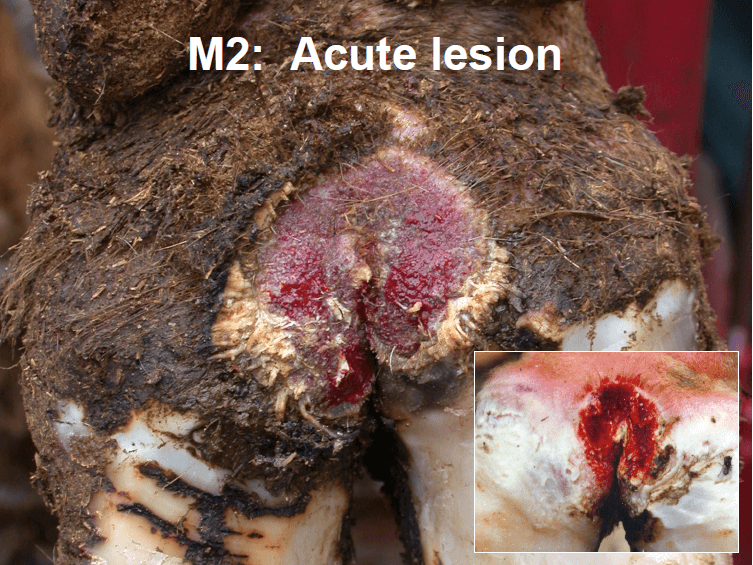 The most important aspect of treatment is that active M2 DD lesions are detected and treated early and appropriately. Common treatments include licensed topical antibiotic spray or copper sulphate based products, although there are concerns surrounding both about environmental contamination and selecting for antimicrobial resistant bacteria. The method with which treatments are applied is also important, with two broad options: “bandage” or “no bandage”. 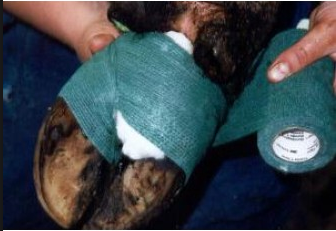 Bandages can be applied over the treatment (Figure 3), although it is imperative that the bandage is removed within 48 hours; leaving the bandage on for longer is unlikely to aid the treatment and can cause serious lacerations that are greatly detrimental to the cow (an example is shown in Figure 4). Alternatively, washing the foot with clean water then drying and treating with topical antibiotic spray is another good treatment option. Studies have shown no significant differences between the two options, provided that each is done well. The practicalities of early detection and treatment of DD can become more challenging in the face of a bad flare up, where high numbers of active lesions are occurring. Here, rapidly getting on top of the situation is imperative, and it is a good opportunity to get your vet and foot trimmer involved if extra input is needed. A parlour visit can identify all affected cows and they can be separated out for treatment; treatment should be repeated daily for up to three days if necessary. Whilst this is a lot of work, a recent case study showed that investing the time and getting in help to manage a flare up can break the back of the problem, and the study found that DD remained exceptionally low for many months afterwards. Engaging with your vets about how you can formulate a coordinated approach will give rewards in the long run. For either uninfected cows or those with a dormant lesion, disinfectant foot bathing is used to prevent an active lesion from developing. Note that foot bathing must only be used as a strategy for prevention and active DD lesions should not be treated using a foot bath. Many good foot bathing products are available, although we must give careful thought to their use. Formalin is an important and effective product, but is a carcinogen (Category 1B) so employees handling it must be provided with appropriate training and equipment. Copper sulphate is also an important product, yet has environmental concerns associated with it. Usefully, foot bath acidifiers can decrease the amount of copper sulphate required for the effective concentration to be reached. There are many other products available and unfortunately their effectiveness has not been compared against each other. However, if you’re looking to make a change or implement a new strategy, start by having a chat to your vet and foot trimmer, and collecting some data on the DD situation so that you can monitor the response to any changes. There are plenty of other important areas that we won’t cover here, but are great topics for discussion with your vet and foot trimmer. For example, efficient foot bathing requires good facilities, to ensure the appropriate size and depth of foot bath, and to make replacing the contents easy and hassle free so that it becomes part of a normal routine. Hygiene of housing is important, as is the status of new stock being brought onto the farm; even if you have DD, you don’t want to buy in a more aggressive strain. And of course, don’t forget about your young-stock and dry cows! Hang on a second, why haven’t we recommended antibiotic footbaths to treat DD? Well, antimicrobial resistance is an enormous and real threat to both human and animal health and the use of antibiotics in agriculture is being scrutinised internationally, causing mounting pressure on the agricultural industry to cut usage. Vast volumes of antibiotics go into footbaths; in fact recent calculations at the University of Nottingham highlighted that monthly antibiotic foot bathing would use approximately 7 times the amount of antibiotics than a blanket dry cow therapy policy; i.e. antibiotic footbaths use huge quantities of antibiotics, which are poorly targeted. They even remain active in the environment when disposed of, so they maintain the potential to promote antimicrobial resistant genes far beyond their contact with the cow. We feel that there is little or no justification for the use of antibiotics in foot baths as there are always more appropriate alternatives. In summary, DD remains a perpetual pain in the picture of lameness. However, we can have the best chance of preventing DD by regularly foot bathing with disinfectants and the best chance of resolving active lesions by detecting and treating as early and as effectively as possible. 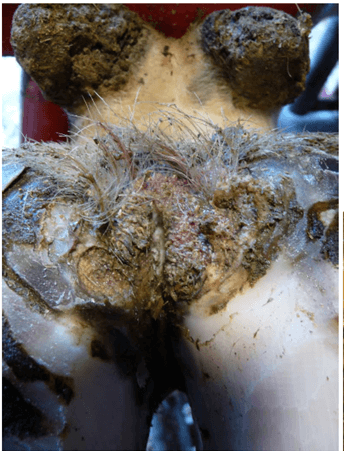 A coordinated approach with excellent communication between the farmer, vet and foot trimmer can lead to a wealth of knowledge and experience being combined, which is vital in a successful lameness control program. Figure 1: Active “strawberry-like” digital dermatitis lesions (also termed “M2 lesion”). Figure 3: Bandage being correctly and loosely applied, to be removed within 48 hours. Figure 4: Severe laceration through vital tendons, caused by a bandage having been left on too long.